The oldest Irish Bar in Cleveland, since 1910. My pick for celebrating St Patty's Day. I had my first Irish Car Bomb here. Every Friday, they have a musician(s). Free shuttle to Cavs, Indians, and Browns games. A very friendly bar where the owners & staff remember your name. The trick is they identify your tab by your name. I come here on Fridays to check emails (free WIFI), enjoy great entertainment, watch the game, and drink cheap PBRs ($2 pints). They have a good selection of beer and good food. I've had a Dublin Apple, Jameson Whiskey, O'Hara's Irish Stout, $2 Corona/Corona Lights (Tuesday special), and Wisenbier Wheat Ale (made locally at the Brew Keeper in Strongsville). The Flat Iron Cafe was my first stop on a recent trip to Cleveland. It was a little bit of a struggle for me trying to find this place that is located in The Flats. When we arrived on an early Sunday evening we were practically the only people in there, but more people began to arrive throughout our stay. We bellied up to the bar and I ordered a Great Lakes Grassroots Ale on tap, which was a super tasty saison blended with coriander, lemon balm, chamomile and lemon basil. This beer was fresh and thirst quenching while the temp was warm outside. The bottle selection is much more diverse and appealing with options like Vanilla Java Porter, Orval, Rochefort 10, Brooklyn Lager & IPA, Victory Hop Devil, Sierra Nevada Porter & Pale Ale. They also have 4 Great Lakes beers in bottles too. I've heard the food here is really good, but it wasn't in my plans that night. I liked it here, I appreciate the rich history of this fine establishment having been a presence in Cleveland for almost 100 years. 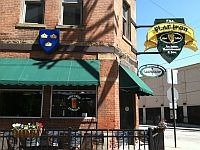 The Flat Iron is the oldest Irish pub in Cleveland. They try to sell mostly Irish products, both food and drink. So, they a lot of Irish beers (Guinness, Harp, Murphy's, Smithwick's, etc)on-tap and in bottles, and liquors. They also do have a pretty decent selection of imports and craft brews in bottles (at least thirty, probably), at least when I was there. I know they have Irish musicians there on certain nights. A good atmosphere, and some pretty good Irish and American cuisine. Can be kind of expensive, depending on what you order, both foodwise and drinkwise. Arrived on a Friday night to see a live musician play (Donal O'Shaunnesy). I'm a Cleveland native, but haven't lived in the area for ten years and this is my first chance to try the Flat Iron. The bar itself has been in existence since 1910 or so, and while the buildings has gone through considerable renovations and upgrades, the bar retains it's historical feel. The wait staff is very friendly, and in fact, bought me a pity pint of Smithwick's due to my friends' hour long delay in arriving. A nice tap selection of local favorites Great Lakes and along with the usual collection of Irish beers (Harp, Guinness, Smithwicks, etc. ), along with New Castle, Sam Adams, and Peroni's. I tried some snacks which were good, but did not get into their entrees. It was good pub fare. In all, I was very happy with the experience. Donal is a first rate musician and purveyor of Irish songs, dirty jokes, and healthy crowd participation. Live music seems to be a stable at the Flat Iron, but even as simply a bar, this place has enough character and selection to make anyone happy. I look forward to future visits when I'm in Cleveland. The Flat Iron Cafe may have gone a little overboard with the Guinness propaganda that adorns it's walls, but I can't fault them too much. There's just something about the rooms in this working class pub that's nearly 100 years old. I can't put my finger on it exactly, but it just seems that the Flat Iron Cafe is quintessentially Cleveland. It isn't trying to be much more than that. It's a place for good food, good drink and fun times with friends. The Flat Iron is a rather small place, but it can draw a solid crowd. There's usually live music on weekends - but it isn't really run of the mill bar bands. I've seen some folk and a crazy 50's/60s cover band that would put on Roy Orbison wigs or other gags appropriate to a given song. It's a fun place. Since the bar is rather small, the servers tend to be attentive. They are always the most knowledgeable about the micros or low profile-imports but make up for that failing with additional attention. The craft brew selection is just a bonus for an already fine establishment. The Flat Iron also provides a helpful service by running a free shuttle from their door to major Cleveland sporting events and Tower City Amp. concerts. It's a great place to go pre-game, and parking is a lot more reasonable in the flats than it is closer to the event. The beer list on the website isn't complete, or constantly updated. I've seen a good many more micros in the fridge, including some Bells and a lot stronger representation of Cleveland area brews. The food is really what kept me going back to the Flat Iron. It's pretty traditional pub fair that is very well prepared. The French Onion soup is unbelievable. I don't visit without ordering a bowl.